Charlestown, MA The owners of Hood Park received approval from the Boston Planning and Development Agency (BPDA) on an updated master plan, which will enable Hood Park to continue the transformation of the 20-acre site into a mixed-use, transit-oriented destination. SMMA is the architect of both the Master Plan and 10 Stack St., which includes seven new buildings, totaling one million s/f of additional mixed-use, hotel, retail and lab space, as well as additional parking, allowing growing tech and innovative companies to stay in the city. The BPDA also approved the development of 10 Stack St. and an addition to the already under construction 100 Hood Park Dr. The 10 Stack St. office and lab building will support new businesses and accommodate existing businesses at Hood Park, like Indigo Ag, Inc., which are looking to remain based in town with headquarters at Hood Park, while they grow and add new jobs in the technology sector of the market. In addition to much-needed lab and office space, the new Hood Park will include publicly accessible open spaces for tenants and residents, as well as the local community and visitors, including a one-acre park called Hood Green. The open space will allow for a variety of programming, such as concerts, farmers markets, art exhibits, festivals, and exercise classes, and will also feature a children’s splash pool and open lawns, making Hood Park a new destination for all in the community to enjoy. The creation of a new bicycle path and pedestrian walkways will make this area safely accessible to all. To support the professional development of the city’s youth, Hood Park will collaborate with businesses on a summer employment/internship program for local teens. Similarly, Hood Park will contribute up to $12,000 per year to a local program focused on providing teen employment and internship opportunities for five years. Hood Park will also create approximately 4,000 square feet of community and education space that will be geared toward youth in Charlestown. Hood Park is located within an emerging growth and development corridor stretching from Kendall Square and downtown Boston to Assembly Square in Somerville and the Wynn Casino in Everett. Hood Park is currently comprised of three office buildings at 500, 510 & 570 Rutherford Ave., which are currently fully leased to office and lab tenants such as agriculture startup Indigo Ag, Inc., Cambridge College and ERT, a global data and technology company. The Harvey, a 177-unit residential building, is currently under construction and slated to open this spring. Construction is also underway at 100 Hood Park Drive, which, once complete later this fall, will contain lab and retail space. Since filing an updated Notice of Project Change in September 2018 and an Amended and Restated Master Plan in December 2018, Hood Park has held a number of community meetings to keep the community up-to-date with proposed changes and solicit feedback. Building heights were also adjusted to reflect new zoning implemented by the Boston Zoning Commission at the end of 2018, with the tallest building topping out at 262.5 feet. 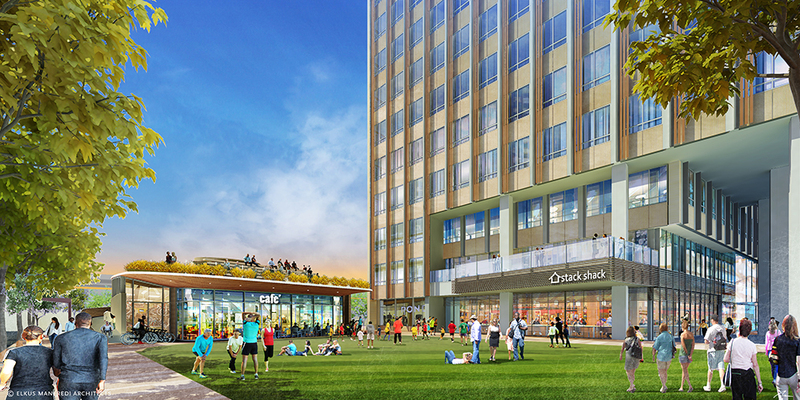 This project was to appear before the Boston Zoning Commission on April 10 for final approval. If approved, construction will take place in multiple phases starting in October 2019 and is expected to be complete in 2027.